The High Limb Chain Saw, available from Centrephone Services has intoduced a whole new method of cutting down high tree limbs. 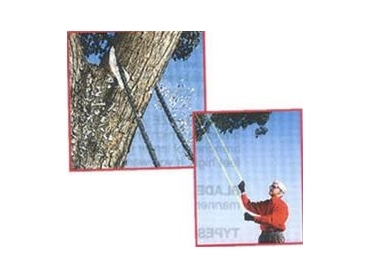 Because of this new "saw on a rope", the job of tree trimming is now safer and easier than ever before and can be done while standing on the ground. Product Description: The High Limb Chain Saw is constructed of patented chain blade which features Bimatic carbon steel cutters. These cutters are engineered for hand use and maximum cutting efficiency as the blade is drawn back and forth. Lightweight, but extremely strong, polypropylene ropes are attached to each end of the blade. A sandbag throwing weight is attached to one rope end. The polypropylene ropes are electrically non-conductive, and will pose no problem if the saw comes in contact with overhead wiring. To use the saw, simply throw the sandbag "safety weight" over the limb you want to cut and pull the blade up into position (the blade automatically adjusts itself, cutting edge down). As you begin the sawing motion, you'll notice that the High Limb Chain saw cuts faster than conventional saws since it wraps around the limb and cuts three sides at once. Branch Size and Height: The High Limb Chain Saw is most effective on branches which are 5 inches or less in diameter, however, with extra effort it will cut branches of larger girth. With the amount of rope supplied it's easy to cut limbs 25 feet high. If you want to cut higher limbs, simply add more rope. Blade Sharpening: The High Limb Chain Saw may be sharpened in the same manner as a conventional chain saw blade with 5/32" circular file. Types of Wood: The saw works on virtually any type of wood.